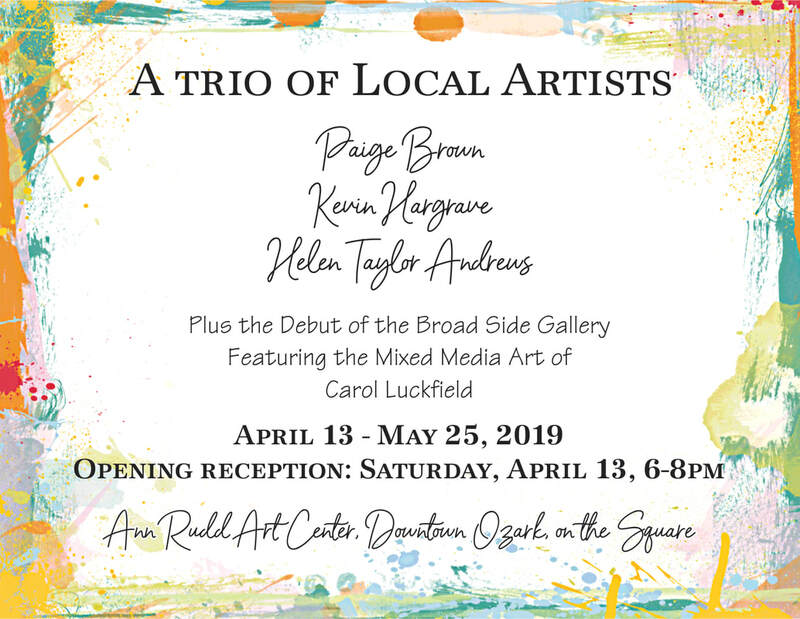 The Ann Rudd Art Center is extremely pleased to announce “A Trio of Local Artists” presenting the art of Helen Taylor Andrews, Paige Brown and Kevin Hargrave, plus the debut of the Broad Side Gallery featuring the mixed media art of Carol Luckfield. Paige Brown is a self-taught artist from south Alabama. She discovered she could paint five years ago and now her art is scattered over the U.S. and is in Europe. She is inspired by her surroundings and bold color which is a key element in her acrylic paintings. Currently she is focusing her talents on bird hunting themed art. In her words, “I love the elegance and southern flair that the sport exudes, along with the beautiful colors the birds provide.” Presently, her florals, dogs, and farm themed images are being used by Lucky Bird Clothing Company on clothes, pillows and other home décor in retail stores nationwide. Originally from Salisbury, North Carolina, Kevin Hargrave now calls Enterprise home. He got his start early in life drawing cartoon characters but his art has evolved over the years and he has been featured in numerous exhibitions throughout the south. His favorite subjects are people and animals. When asked why, he said, “Because of the unique depth and dimensions each brings to the canvas.” He also said he breaks the rules of art to make his work his own. Kevin captures a depth of reality with acrylics and pastels and his love of music is expressed through his portrayal of jazz musicians. Carol Luckfield’s passion for paper has become an evolution of creative discovery. Her experimentation with paper ephemera led her to develop her own eclectic art form. She explains, “There is an element of chance and serendipity working with paper. And at times, it’s almost meditative.” Her mixed-media art will be in the Broad Side Gallery, a unique space for small displays. The opening reception is Saturday, April 13 from 6:00 to 8:00 p.m. and is open to the public. Come and celebrate the unique art of our local artists.